We’re having a good video year! Our in-house filming and editing suite is run by Hayes Cunningham who has the capacity to direct, film and edit corporate videos and film as required. He heads up a team of videographers, photographers, lighting & sound technicians and editors according the individual project specifications. You can find out more about our Corporate Video Production at our website. March brought about a whirlwind of a project which Hayes embarked on. The project was to film a new fresh Corporate DVD for the Three Cities Hotel Group and involved 14 Three Cities hotels all around the country and Africa. The aspect which made this project a truly unique (and somewhat delightfully stressful) project was that all 14 locations where filmed over a period of a month and a half. So Hayes truly became a jet setter! The hotels that were filmed included the all green Gateway Hotel in Umhlanga, the stunning Alpine Heath Resort in the Drakensberg, the breathtaking Plettenberg Park Hotel & Spa in Plettenberg right through to the Victoria Falls Safari Lodge in Zimbabwe. One of the benefits of the type of camera and rig that we use, is that we need a smaller team and have more mobility for easy travel and the ability to get into some less accessible places. Hayes was lucky to get up close and personal with the elephants whilst filming in Zambia! Hayes met some wonderful, talented people along the way and even got to walk with the elephants at the David Livingstone Safari Lodge & Spa in Zambia (tough life hey!). We also produced a flash mob video! Three Cities launched their corporate video at Tourism Indaba Conference 2012 at the ICC, Durban. We were excited to be involved with another video for the conference, which involved assistance with planning, and videoing a flash mob! Halo Media was involved in was the filming of the arrival and landing of the new Boeing 777-300ER at King Shaka International Airport. 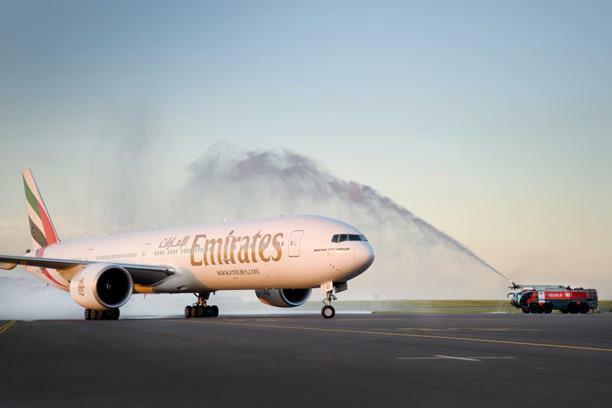 This was the first time for Emirates to have an aircraft of this nature arrive in South Africa and an introduction of first class travel to Durban. Halo was there to capture the special moment when the Boeing was sprayed with water from fire engines to celebrate it’s maiden voyage. It was quite an experience to be on the runway at this moment. Are you passionate about beautiful corporate videos which bring your brand to life? You can find out more about what our graphic design studio, Halo Media, loves by following us on Facebook and Twitter.